For Alexander the sacrificer of Christ tamed them. You departed Alexander and behold Him. 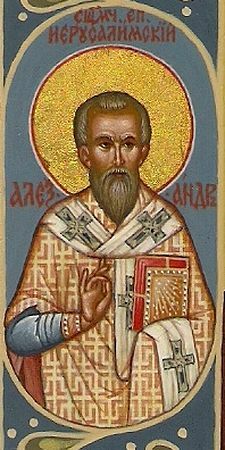 Saint Alexander was a student of Clement of Alexandria, who dedicated his Ecclesiastical Canon to him, and a fellow student with Origen. During the reign of Emperor Septimius Severus (193-211), Alexander was imprisoned for his faith. 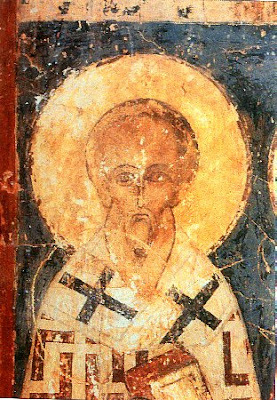 After being released from prison, he then became the first Bishop of Flavia in Cappadocia. By divine direction he then traveled to Jerusalem to fulfill a vow to venerate at the holy places. According to Eusebius, "They received him there with great cordiality, and would not permit him to return, because of another revelation seen by them at night, which uttered the clearest message to the most zealous among them. For it made known that if they would go outside the gates, they would receive the bishop foreordained for them by God. And having done this, with the unanimous consent of the bishops of the neighboring churches, they constrained him to remain." Thus Bishop Alexander served with Archbishop Narcissus (Aug. 7), assisting him in the government of the Church of Jerusalem. This arrangement was an unusually rare occurrence in the ancient Church. As Eusebius writes, "Alexander, himself, in private letters to the Antinoites, which are still preserved among us, mentions the joint episcopate of Narcissus and himself, writing in these words at the end of the epistle: 'Narcissus salutes you, who held the episcopate here before me, and is now associated with me in prayers, being one hundred and sixteen years of age; and he exhorts you, as I do, to be of one mind."'" Following the martyric death of Archbishop Narcissus in c. 211, at the age of one hundred and sixteen, and the passage of another year in which others served as Archbishop, Alexander succeeded him and governed the Church of Jerusalem for thirty-eight years at the age of thirty-seven. During these years Archbishop Alexander established the first library of Christian theological works at Jerusalem. He compiled all the surviving works of Gaius, Hippolytus, Beryllus, and numerous other ecclesiastical writers. Eusebius affirms in his Ecclesiastical History (Bk. 6, Ch. 20) that it was from this library that he gathered his sources: "There flourished many learned men in the Church at that time, whose letters to each other have been preserved and are easily accessible. They have been kept until our time in the library at Aelia [Jerusalem], which was established by Alexander, who at that time presided over that church. We have been able to gather from that library material for our present work. Among these Beryllus has left us, besides letters and treatises, various elegant works. He was bishop of Bostra in Arabia. Likewise also Hippolytus, who presided over another church, has left writings. There has reached us also a dialogue of Gaius, a very learned man, which was held at Rome under Zephyrinus, with Proclus, who contended for the Phrygian heresy." Prior to the reign of Emperor Decius (249-251), there was a relative period of peace for Christians, until he unleashed a fierce empire-wide persecution in which he ordered all Christians to sacrifice to the idols. Those who did not comply were punished severely and would forfeit their life to a woeful death. As for Alexander, he was delivered to the prefect of Caesarea in Palestine in iron chains, and a long dialogue ensued between them. With a loud and clear voice so that he could be heard by all, he proclaimed Christ as God and King and Creator of the whole world. The idols he declared to be demons and a clear delusion. He also anathematized all those who venerated and honored them with a lively and bold voice. These words troubled the prefect, and enraged him. Therefore the Hierarch of Christ was ordered to be tormented with various torments. Shortly after this, Alexander was condemned to be devoured by wild beasts in the theater. They therefore undressed the Saint and had him stand naked in the center of the theater like a ram, and they unleashed various wild beasts against him. The servant of Christ therefore prayed, and at the end of his prayer he said: "Lord, if it is your will that I die now, may it be done according to Your will." Then the beasts - O the miracle! - some of them venerated the Saint, bowing their heads and returning to their dens, while others rolled about on the ground, kissing the feet of the Saint, and yet others licked his wounds with their tongues. The great Hierarch thanked God for this, and he surrendered his holy soul into His hands, leaving his unharmed body on the earth. Certain Christians with reverence then took his body and anointed it, wrapping it in linen sheets and burying it in a chosen place. Eusebius has preserved fragments of a letter written by him to the Antinoïtes; of another to the Antiochenes; of a third to Origen; and of another, written in conjunction with Theoktistos of Caesarea, to Demetrios of Alexandria.